Tia our Irish Sports Horse Mare who is expecting her first foal on the 3rd May to Zidane our Dutch warmblood stallion. Tia has also got a large baby bump and a less developed udder to Nicoh. Tia has also increased her udder size and is sleeping a lot now lying flat out. She seems tired and her baby bump is now huge! Bigger than Nicoh’s!! She is breathing heavily constantly whilst she’s lying down. Tia is sweaty and agitated tonight which is out of character for her. She keeps lying down and getting up and looking at her belly. Seems uncomfortable. Not sure which camera to watch as both girls showing signs! Tia also seems a bit grumpy with Nicoh and is happy to keep her distance, so different to how they’ve been over the last few months together. Her baby bump is now huge and also has dropped, wonder what she’s carrying! Thinking she might want to beat Nicoh to foaling first! Tia also quiet and lying flat out. Lots of swishing tail, sleeping and eating. Tia is just looking huge and tired. She keeps looking at her belly; think she can’t understand what’s happening! Confused.com!! Tia noticeably developed udder, don’t think she’ll be too far behind Nicoh. Tia is spending lots of time getting up and down, biting her belly and kicking. Tia has started to dig her bed and is shifting her weight from side to side. She is also stamping her feet lots and swishing her tail. Tonight you can see baby kicking a lot. Poor Tia doesn’t know what to do with herself! Tia is mooching and smelling her bed a lot, still weight shipping and holding her tail to the side, sleeping a lot…. Flat out! Today Tia has been pawing the ground and has been quite restless in the field. 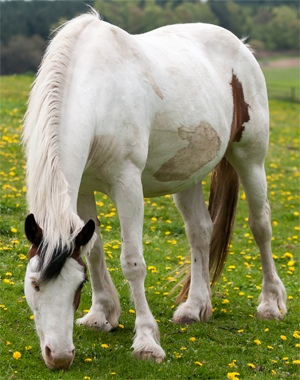 This evening she has been rolling and is making her nest….Hopefully the foal isn’t too far away! No signs at 4am…. no signs at 5am…. and then on the monitor at 6am our latest baby girl had arrived! Emily our stud vet had warned me that maiden mares are very sneaky! How true is that?! A perfect pinto filly – we have named her Arizona! As Oregon was now nearly 7 months old the time had come to start weaning him from his mother. As this can be a traumatic time for mother and baby we try to make it as stress free as possible. They had already spent a number of weeks as part of the herd, with Wispa teaching her boy social skills and how to make friends in a herd. He had formed strong bonds with both Dakota, his big brother, and Shrimp and would often be away playing with these two instead of being at his mother’s side. We turned the herd out as normal in the afternoon, along with Oregon who skipped off happily to play with his friends under the watchful eye of Larosa, our surrogate mother who seems to take all the babies under her wing. Wispa was then stabled and spent the night enjoying the peace and quiet without someone stealing all her hay.Wispa then spent the next few days going out in the field with Nicoh, who is also currently stabled and expecting a baby in April, during the day and stabled at night. Oregon came in with the herd during the day and was out in the fields at night. The time had now come to start bringing Wispa back into work. 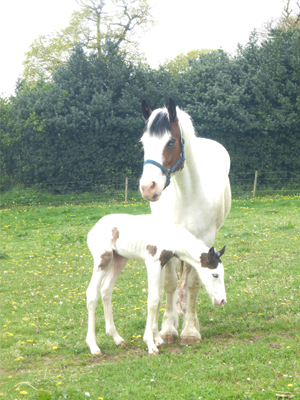 Prior to having her foal Wispa had started being broken in. We had been long lining her, backed her and she’d been out on the Chase a couple of times. As she had had nearly a year off work she’d need to start from the basics again. We started her off on the first day on the long lines re-establishing the basic walk, trot and stand commands. She took all this in her stride and was quickly back into the swing of things. The following day the long lining was repeated and then we reintroduced a rider. Steadily leaning over her at first and when she showed us how relaxed and happy she was with everything the rider mounted fully and we went through a few basic walk and stand movements. Again all taken in her stride and as if she hadn’t had a break at all. Impressed by her progress so far we decided to try a little short ride out on the Chase. So accompanied by Chase, our most sensible baby sitter, we were off out for an hour of walk and a few short bursts of trot. Wispa spending the whole time having a good look at everything the Chase has to offer. Time for some proper trekking today and Wispa accompanied our 1 hour novice trek. Again perfectly behaved and starting to look like part of the team. After a few days off it was time for the next step in her training. Wispa went out with our morning experienced trek. This would be her first time working properly doing more trotting and having her first canters. She sat in the middle of the group and cantered away happily up the hills. Power of the herd working at its best she had a fun morning out with her friends doing what they love to do. Following this Wispa was ridden out by various different staff members on all the different levels of treks including experienced morning rides and mixed ability rides both with the cantering group and walk trot groups. Once we were happy she was going well and was happy in her work we started putting some of our regular customers on her to take her out. We have had good feedback from all the customers that have ridden her, many of whom have seen her grow up from a baby. Wispa completed her first pub ride and was a complete superstar all day. Think she was pleased to finally be classed as one of the gang eating her lunch at the pub next to her good friend Gabriel! Working with young horses is always rewarding and seeing them grow up from foals to adults as we do here is all the more rewarding. They seem to take to their work so well and having been here from birth they slot in to trekking life so easily. Looking forward to when young Oregon is ready to start his training too!